Almost three weeks ago Superstorm Sandy roared ashore and devastated vast parts of our region. She destroyed the homes of tens of thousands of people, disrupting and/or inconveniencing the lives of millions of others. I’ve wanted to write about this for more than a week, but whenever I set aside time to do it, something more pressing always came up. 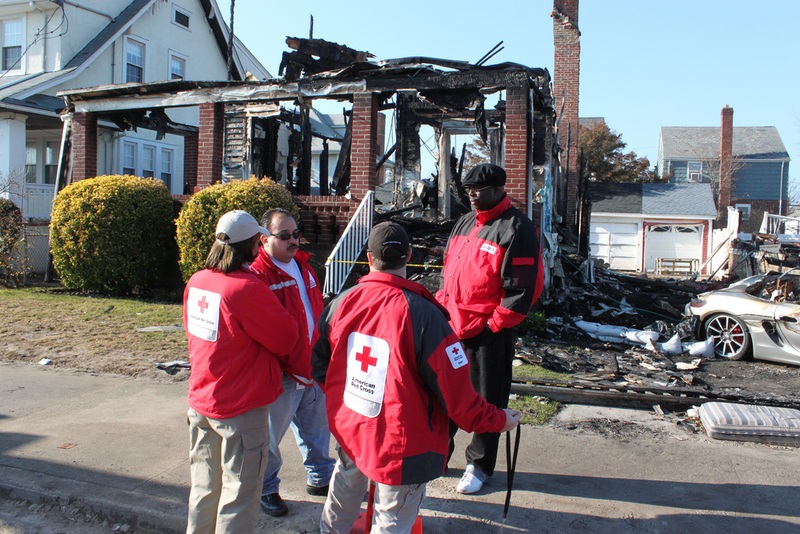 American Red Cross Southeastern PA staff at the scene of a massive fire in the Rockaways section of Queens. The fire was a direct result of Superstorm Sandy. For starters, I have mixed feelings about the result of Sandy. On the one hand, I feel eternally lucky that my home was spared any damage. I didn’t even lose power. Most of my friends were also spared. My brother and his family in north Jersey had no power for more than a week, but otherwise were fine. I am also grateful the Philadelphia area largely dodged a bullet. Yes many people had damage to their homes and cars, and tens of thousands lost power, but relatively speaking, Philadelphia and its immediate area avoided a catastrophe. That’s obviously not the case with our friends and neighbors to the east and north. This is why I’m conflicted. I feel terrible about what has happened along the Jersey shore and New York. It’s awful. Basically, I’m glad it didn’t happen here, but heartbroken it happened there. 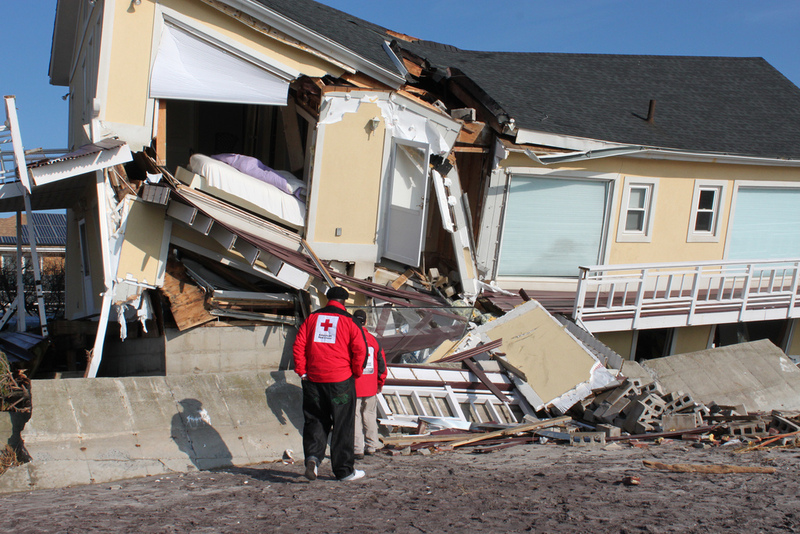 American Red Cross Southeastern PA staffers stop at this home in the Rockaways section of Queens during a tour of just some of the damage. This home in many ways is symbolic of the damage Sandy inflicted. No matter the conflicted feelings I have about Sandy’s destruction, however, one thing I am not conflicted about is my pride in the Red Cross. No non-governmental or military organization can do what the Red Cross does on the scale it does it, as efficiently and effectively as the Red Cross. NOT ONE. Sure things haven’t been perfect, but the Red Cross is fulfilling its promise and its mission to alleviate human suffering. We are providing emergency relief to tens of thousands of people every day. There is no disputing that. Here at the American Red Cross Southeastern Pennsylvania, we spent days preparing for a calamity. We dedicated enormous time and resources trying to educate the public about how to prepare and what to do. We positioned volunteers, supplies, etc. across the region. We sheltered more than 600 people before, during, and after Sandy hit in our area alone. Several shelters were open for a week for people who lost power. We also provided shelter for pets, thanks to a partnership with the area’s County Animal Rescue Teams (video below). This prevented people from having to make the awful choice between staying behind and potentially be in danger or leaving their pets behind. We even set up in a matter of hours a mega shelter with the potential to hold 1,300 evacuees from New York, New Jersey, and West Virginia. We provided supplies to help the hardest hit areas of our region clean up and rebuild. Once the danger passed in our region, we stepped up our efforts to help New York and New Jersey. Southeastern PA American Red Cross Chief Operating Officer, Clifton Salas is one of the leaders of the entire NY Sandy relief operation. 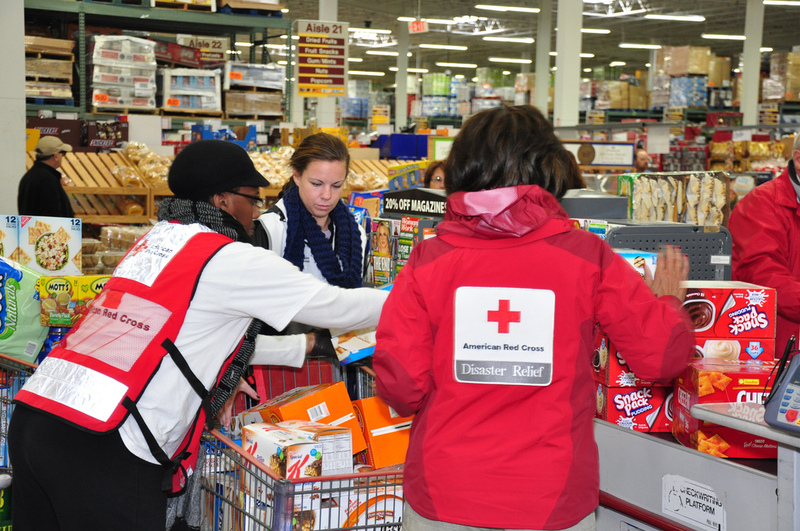 American Red Cross Southeastern PA spent thousands of dollars on food on its way to New Jersey to deliver food and supplies to hundreds of people. Southeastern PA has sent (and will continue to send) dozens of volunteers for several week deployments to help with things like food and supply distribution and mental health counseling. In addition to that, we send dozens of volunteers for day-long and weekend trips to NY and NJ. Many drive the big trucks that distribute food and supplies. Others literally walk door to door in hard hit neighborhoods (video below). 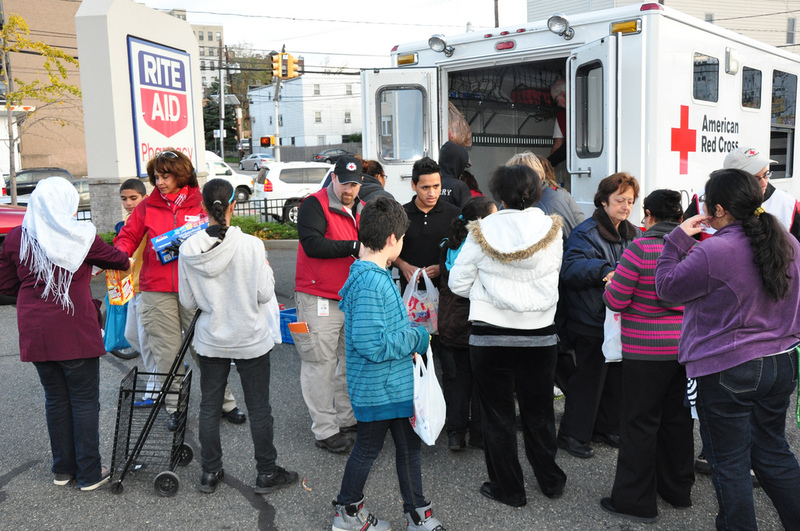 While the Red Cross is the best equipped non-governmental agency to handle a massive crisis like Sandy, the Red Cross knows it cannot do it alone. The Red Cross cannot be all things to all people and cannot be everywhere all the time. So we lined up dozens of partners to assist with food distribution, sheltering, and relief supplies. We also had partners provide services that the Red Cross doesn’t typically offer. There will be always be critics. The Red Cross is not and should not be above criticism. But any criticism that attacks the effort and will of the Red Cross and its volunteers and staff nationwide, is entirely misguided. The dedication and commitment of a Red Crosser is unparalleled. Period. End of story. There are bound to be missteps during a relief operation the size and scope of Sandy. Perfection, though, is not the goal because the Red Cross does not set unattainable goals. Success is the goal. And by any measure the Red Cross response to his point has been a success. And the ongoing support the Red Cross is receiving is a remarkable reflection of that. I love my job. I love the feeling I have knowing I work for an organization dedicated to helping people. But I won’t lie; there have been plenty of days when I couldn’t wait to get home. I couldn’t wait for this to be over. I couldn’t wait for my phone to stop ringing and my email to stop buzzing. And I wasn’t even in NY or NJ. Just like with any job, there are frustrations, politics, and silly rules; days when it feels “like just a job.” But in the midst of a disaster, those things ultimately don’t matter. You jump into action. You do what needs to be done. You hope you’re doing some good and helping people. Now I can confidently say that I’m no longer hoping. I know for sure that I am. Dave, thanks for this great blog post! It makes me so proud to be part of the Red Cross.